As constant innovators always striving to push back the boundaries of learning and communications, Riverstone Language & Communications has launched a new series of “grammar ads” aimed at making the basic constructions of English more visually appealing and memorable to students of English. Each grammar ad takes the form of a landscape photograph superimposed with a single sentence or expression in English. Underneath the sentence / expression is a reminder of the rule or some other language-related input. The overall effect is more akin to a two-page advertising spread in a magazine or a billboard poster than the usual dry treatment of grammar in a text book or classroom presentation. “My aim with these visuals is to make each utterance as memorable and engaging as possible,” says Riverstone CEO and Head of Innovation, Robert Dennis. “People generally find it difficult to remember examples of English grammar and their underlying rules as the way they are taught is often devoid of any real context or is presented in a stark, abstract way on a whiteboard or on a bare page. Our Riverstone Grammar ads bring the context to life by using an intriguing, rich image which seems to tell a story. The accompanying text also adds to the effect, suggesting some ongoing narrative or larger context that is both cognitively and emotionally complex. According to Robert, advertising is the single most powerful communications tool known to man (and woman). Advertisers throughout the 20th century and in the present as well create bold, memorable images usually accompanied with a short, impactful slogan or message to sear a brand proposition into the mind and memory of the viewer. “Coke is it”, Nike’s “Just Do It” and “Guinness is good for you” are phrases that have entered the language – and their artwork is just as famous: Coke’s iconic images of American life, the Nike swoosh logo and Guinness’s bestiary of everything from toucans to white horses. Why not do the same with grammar? 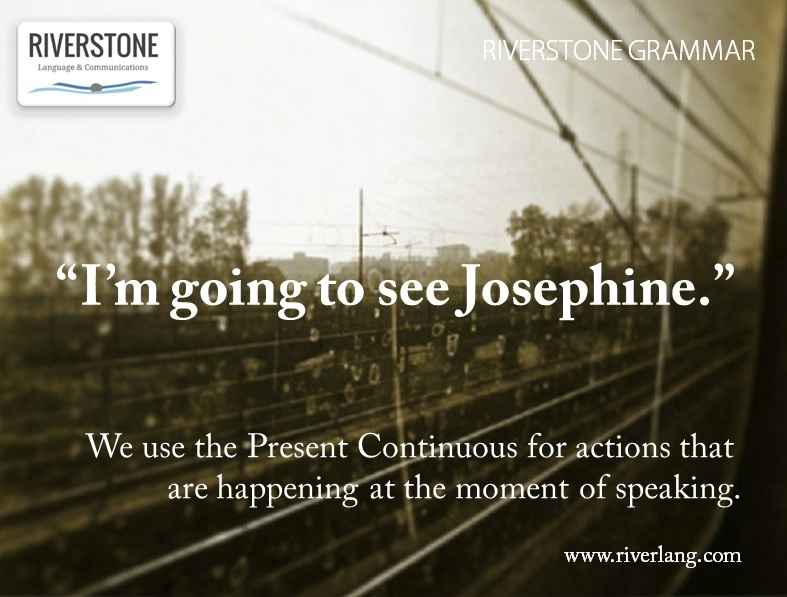 The grammar ads have been incorporated into Riverstone’s social media feed, principally on Facebook, where people are used to seeing “inspirational” messages often in the form of a mini-poster with decorative graphics. Robert noticed that most of the English language pictures posted by educators tend to be purely instructional: vocabulary collections or adapted versions of slides from language input presentations, etc. Other visuals posted by language schools and teachers are typically cartoons, Photoshopped images of celebrities – or just the run-of-the-mill Facebook “noise” with little or no relation to language learning or grammar other than the fact that the material is in English. Feedback has been positive and the images have attracted some good responses and even sparked discussions of the language points being highlighted. 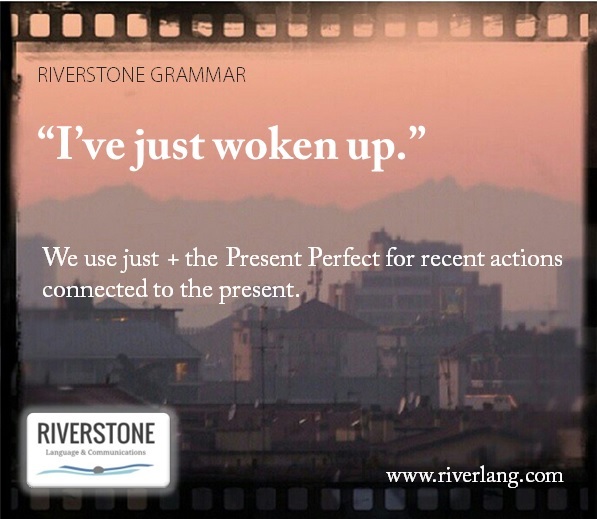 Each grammar ad is branded with the Riverstone logo and the web address www.riverlang.com. The tag Riverstone Grammar is included, but there is no explicit advertising message or call to action: the main aim is to encourage sharing and raise overall brand awareness rather than present a specific offer or sales pitch. 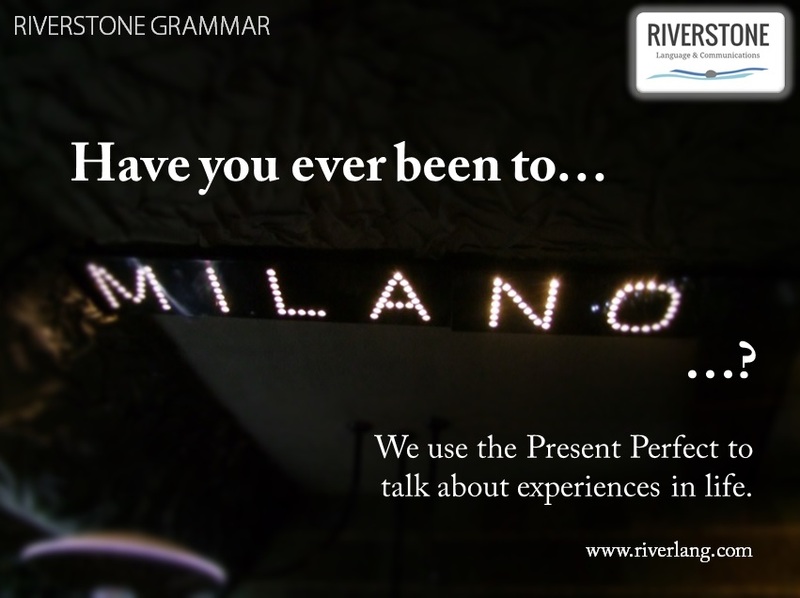 You can see some of the current Riverstone Grammar ads on our Facebook page and on the Milan Business English Network – as well as on the pages of people who have shared them! Look out for more Riverstone Grammar ads – coming soon! This entry was posted in Riverstone News and tagged advertising, brands, business, communications, English, grammar, innovation, language, social media. Bookmark the permalink.